By David Shear--Adam Kertesz, an assistant director at The Jack and Pat Kay Centre Camp, recently enjoyed a week in Israel as part of JCC Association’s Israel Up Close seminar, an initiative designed to enhance Israel programming in JCC day camps. The seminar included educational touring in Tel Aviv and Jerusalem, and participation in the four-day training led for all of the summer shlichim - the young, post-army Israelis getting ready to spend their summers working as counselors and specialists in JCC camps. 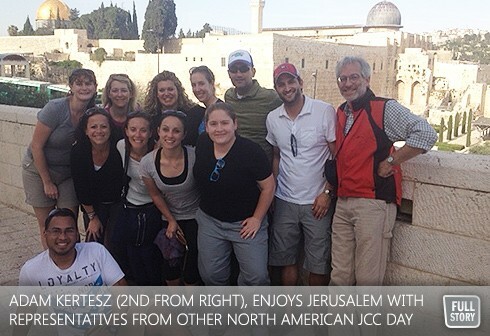 “One of the best parts of being able to take part in the Seminar, in addition to strengthening my own Jewish identity and connection to Israel, is that the six Shlichim coming to our camp now have a firm understanding of our community’s unique culture ,” said Kertesz. JCC Association, the leadership network for Jewish Community Centers in North America, funded the Israel trip for the 10 day camp directors who otherwise would not have been able to attend. “Creating personal connections between campers and staff and Israelis is at the heart of Israel education in our camps,” said Jodi Sperling, Director of Camping and Teen Engagement for JCC Association. The Jewish Agency for Israel runs the training seminar for the summer shlichim to prepare them for their work in the camps. The seminar addresses questions of Jewish identity, how and what to teach about Israel campers and staff of varying ages, programming skills, and cultural differences between North Americans and Israelis. The camp directors in attendance serve as an important part of the training, facilitating groups, leading workshops, and answering questions about the experience to help prepare this year’s shlichim. Now that Adam has returned, his experience is already making an impact on the ground. “We’re thrilled that The Jack and Pat Kay Centre Camp was a part of Israel Up Close,” Sperling says. The Jack and Pat Kay Centre Camp is a key department of both the Prosserman JCC and Schwartz/Reisman Centre of UJA Federation of Greater Toronto. It prides itself on being the largest Jewish day camp in Toronto and Vaughan and couldn’t be more excited to be entering its amazing 25th summer this year. You can expect to see the camp team this year at UJA’s Walk with Israel on May 26th as they show their support for Israel and the entire community. For more information about camp, please contact the office at 416.636.2267 (CAMP) or visit us at centrecamp.ca.